For a pattern without gauge, specific yarn or needle recommendations, I think it turned out quite OK.
Next up are the gloves I'm knitting. Colours are nowhere near accurate, but you still get the picture. 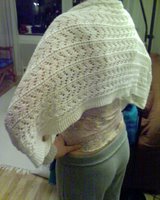 I'm using Drops Alpaca, which is just an excellent yarn. Perhaps not the most exciting, but it's awfully soft, has great yardage and is very affordable. Worth mentioning is that it's the same yarn I used for the Deep V Argyle Vest, but the gauge on the mittens is around 30, and the vest was 22. Yes, it was! I had the right gauge, it was something wrong with the pattern. (Seriously, I did.) My conclusion is that the recommended 23 for Alpaca doesn't apply when knitting with two colours. Deep V Argyle? Have a look, this is the last picture of it. Ever. 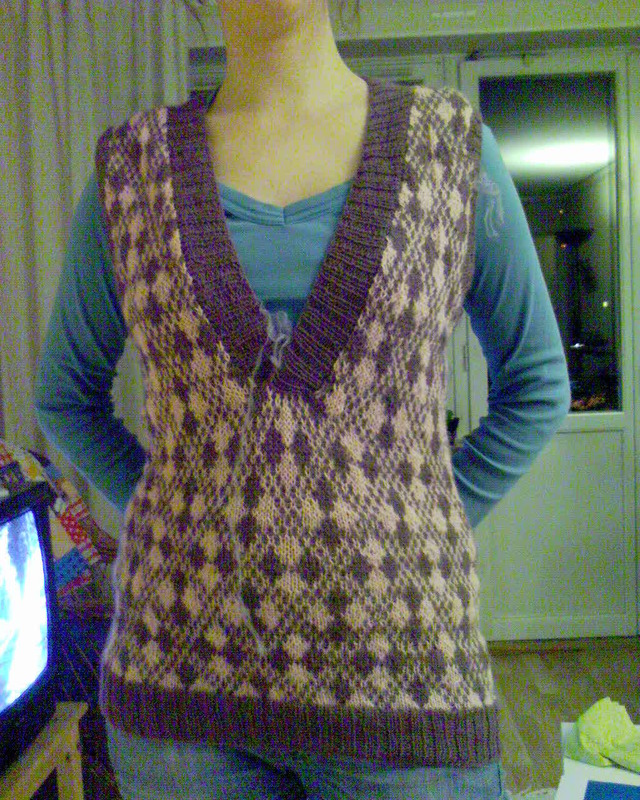 I don't think I have ever knit anything as unflattering as this vest. (I do have a short memory, though.) It's just big and soft. I made the lower part longer, but only 8 rows, so it shouldn't really make a difference. I just want to say it wasn't my fault. My honest guess is that the yarn wasn't ideal for this project, and that I should have used something more conventional and maybe a bit more sturdy. 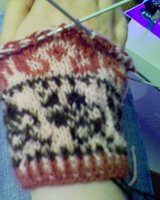 As the glove above shows the stitches much better and is firm without being stiff, I say 22 is too big for Drops Alpaca and the closer to 30 the better. The next big thing might be spinning. I have 0.5 kg of white gotlandish wool in the basement, useless for felting. According to Interweave spinning is very easy. I downloaded the brochures and read them thoroughly on the train yesterday, and I almost get it. I think practice will clear things up, but I have yet to find a spindle. Just have to figure out where to look. Tack så mycket! Jag tycker shoulderetten ser väldigt fin ut! Och jag är imponerad av att du lyckades få till den utan några rekommendationer om garn etc! Vår vän djupa V, jag vet inte hur den kan se så fräck ut på Eunny, och sen så vardaglig ut på oss! Jag tror dock att man behöver en schysst skjorta under, men om jag förstår dig rätt kan inte ens en skjorta "rädda" din djupa V nu?? Oh, if you can't frog, you can cut. Much more fun and value for money too. You cut off maybe like 10-15? 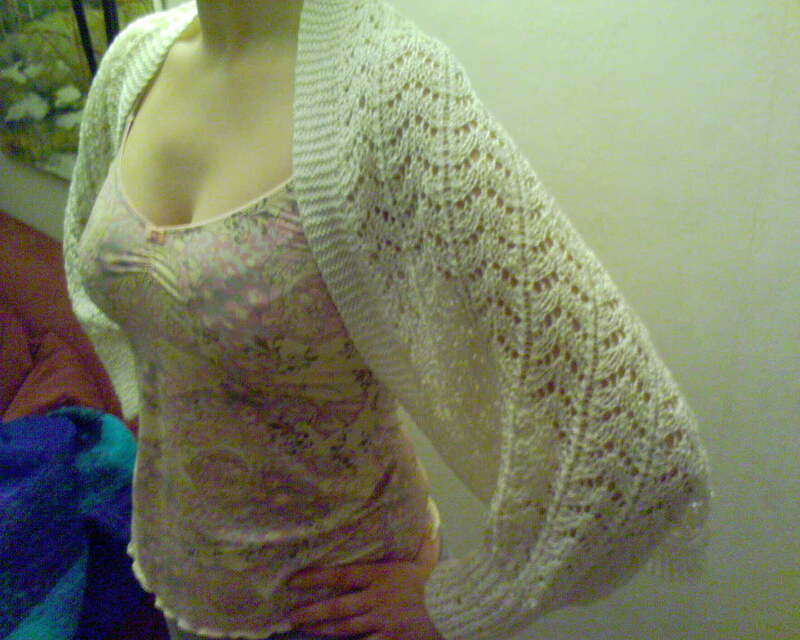 cm and then pick up stiches and knit a new edge. If you want to. The Deep V is now in skeins... I cut it just below the V and ripped it into a two-coloured pile. I'll rip the edges too, and then maybe throw the rest of it in the washing machine. If it doesn't shrink too much I might cut out nice and warm winter soles from it. :-) I would have made an excellent housewife during WW2. Me, I still have high hopes for my DVAV though, but I'm considering making the shoulders a little narrower. What do you think?